Extravagant football stadiums are popping up all over Qatar in preparation for the 2022 FIFA World Cup and are the first of their kind in the Middle East. Twelve stadiums will be used for the 2022 FIFA World Cup. Out of the 12, three currently exist and are being renovated, while nine are being constructed. 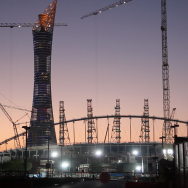 The stadiums' total construction and renovation budget is approximately USD 3billion. Data for this interactive map was retrieved from the 2022 FIFA World Cup Bid Evaluation Report.